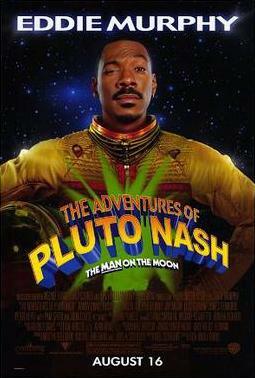 I recently saw the 2002 movie “The Adventures Of Pluto Nash” for the first time. The movie was a complete box office bomb. It cost $100 million to make, but only brought in $7,100,000. Eddie Murphy, the top comedic actor in U.S. history, rarely has a box office miss. However, this one was a miss. Rosario Dawson and Eddie Murphy in "The Adventures Of Pluto Nash"
Murphy stars as Pluto Nash, a former smuggler, who buys a failing night club. A Mafioso tries to force him to sell his business, leading to violence. The film co-stars include Pam Grier and Rosario Dawson. The movie was supposed to be futuristic and in many ways it had that feel to it. However, what was promising and could have been a hit, was packed with cheesy dialog and jokes below Murphy’s standard.